Here's the buzz! If your little bee is as sweet as honey and loves buzzing around, consider having a Bumble Bee themed birthday party. From bee hive honeycomb centerpiece cake, bees macarons and donuts to frosted cupcakes in plant pots. Guests even gets to come home with a honey jar and a wooden honey stick! Come rain or shine! Pastel rainbow hues with delicate white that we fell in love with immediately! 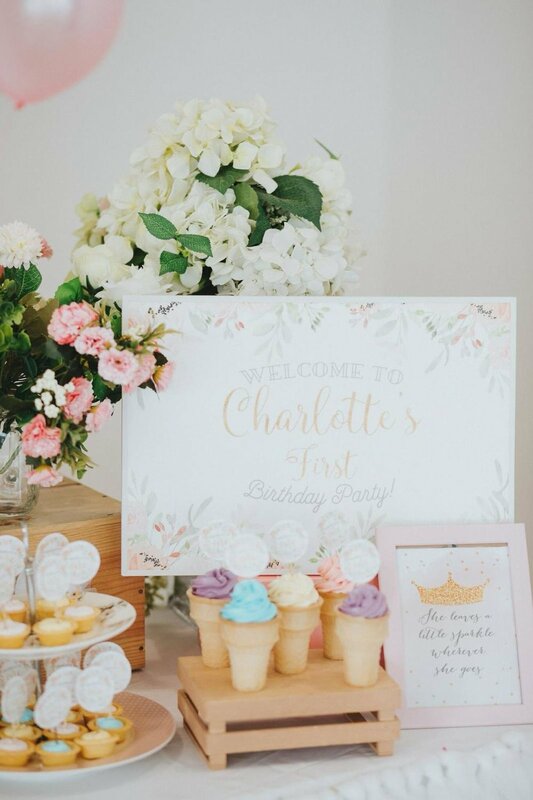 From the pretty custom backdrop to the cute 2-tier rainbow centerpiece cake, adorable ice cream cone cupcakes, mini pastel cream tartlets, and the highlight of the party - a custom “Sweet Shoppe” on a wooden candy cart. Oh what fun it is to turn ONE! If your crowd is full of jet-setters, a travel themed party may be the perfect. Stir up the nostalgia with vintage old world maps, postcards, boarding passes and luggage tags. Traditional globes are a fabulous decoration item. Not only do they add a sophisticated flavour but complement the vintage suitcase decor. The little guests also gets to come home with a “baggage claim” - a specially curated favour bag. The beginning of toddler hood, it is only right to center this event around a childhood favourite, the great tale of Peter Rabbit. With simple chic floral elements, this is definitely a beautiful and nostalgic theme for young children (and their parents). Are you looking to throw your little princess the perfect pink party of her dreams? Here’s a modern pink-and-white birthday party at one of the most beautiful venue - Capella Singapore. Silver tiaras, mini wands and fresh flower arrangements were added on every table and a scrumptious spread of mini cupcakes, chocolate fudge brownies and royal caramel chocolates, the guests sure had a regal and wonderful time! Canary yellow with a touch of flannel gray and white, this sunshine theme party is really unique and refreshing! From the darling daisy centerpiece cake to the soft pink and yellow details. So completely smitten with our delicate gold and blush colour scheme dessert table with balloon backdrop for the bride-to-be. Sky blue, navy blue, robin’s egg blue — there are plenty of reasons to like the color. It’s inviting and cool, reminiscent of the ocean and reminds us of sunny, happy days. We used varying shades of blue, white, and silver. Add some fun to your party with this toy shop theme. This engaging and colourful setup with printed paper pinwheels backdrop, edible marine sea creatures, toy trucks, jumbo alphabet blocks and tin soldiers brings out the inner child in everyone! What’s for dessert? A delicious chocolate milkshake, healthy vanilla yogurt with berries and fresh-cut fruits! This baby shower was organised to welcome a little princess to the world, so tiaras graced the table, and layers of tulle dressed the table, lit by fairy lights. Guests were adorned with strings of pearls and tiaras on their heads, as they enjoyed this elegant and lighthearted tea party. This sweet little Noah's Ark- themed baby shower featured a dessert table with a Noah's Ark centrepiece, a Valrhona chocolate and buttercream cake with a fondant ark, and an assortment of animals looking eagerly at the buffet spread. We chose a vintage carnival theme for this baby full-month party. We decorated the dessert table with vintage toys, streamers and bunting, and carnival stripes, and catered a buffet of Windowsill pies, popcorn and candyfloss, biscuit lollies and cookies featuring circus bears, vintage glass jars of Banoffee pudding and bottles of Guiness-chocolate milkshake. There was a live crepe station, and lemonade stand. 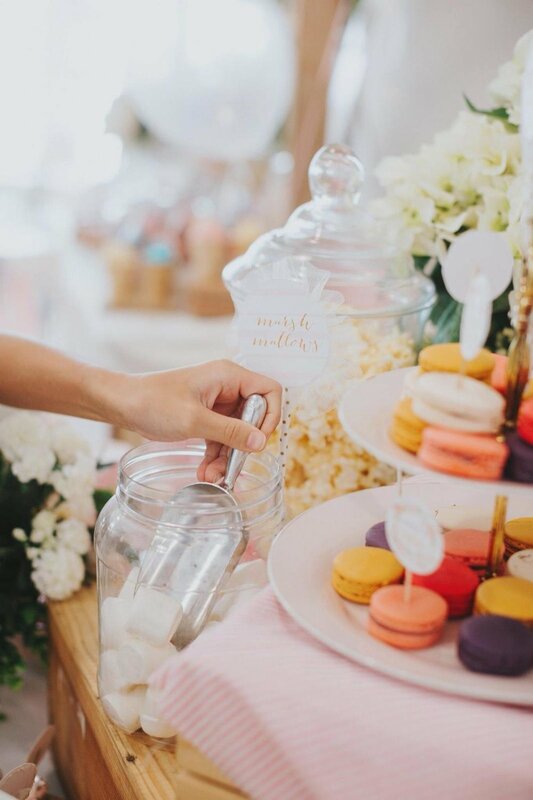 A vintage popcorn machine filled red-and-white striped cups with fresh popcorn, and a vintage-styled ice cream station served Laurent Bernard Chocolatier ice creams in flavours like lavendar and salted caramel. Party favours were carnival biscuits on a stick, or a real live fish in a jar, much like a goldfish one might win at a carnival. 200 guests were invited to sail away on a party to celebrate the birthday of one little sailor boy. We found the perfect venue - Tanjong Beach Club, and Invites went out as messages in glass bottles. On arrival, guests put on sailor hats and wielded telescopes for polaroids taken at the photobooth. Inside, a long buffet table was entirely covered with edible (and very delicious) sand, and piled with nautical cupcakes, crab, fish and octopus icing cookies, and a lighthouse centrepiece. Lunch included brown paper bags of fish and truffle chips and calamari. Friends of the birthday boy had heaps of fun in the sailboat pool and crab-shaped sandpit, ate ice cream from the live handmade ice-cream parlour, and hit a crab pinata. They went home with either a bucket of sandtoys or their very own pet fish.